This conference, MODE, METHOD, MEDIUM brings together artists and cultural organizers who work between disciplines both in terms of medium and in terms economic/field-based distinctions. We hope to take a step towards dialectic and artistic solidarity between the independent and ‘avant-garde’ communities in dance, performance art, theater, and music, and to share our vocabularies and methods. Presentations will include performances, project presentations, artist talks, papers, and interactive workshops. 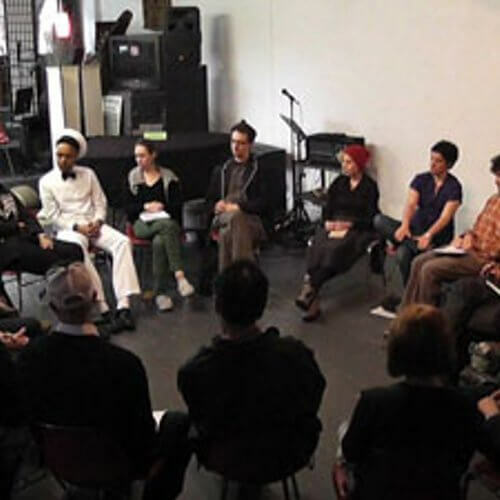 Inherently and formally political, often interactive and/or participatory, always startling and deeply considerate, artists, curators, scholars, and cultural organizers will share their work, discuss their practices, and participate to two open round-tables about what “medium,” as a mode of transmission, means to us now. Handan Ozbilgin, showing part three of her MAIDS project, members of experimental music ensemble thingNY, Ben Spatz/Urban Research Theater, JJ Lind and Liz Vacco of Immediate Medium, Peruvian artist Amapola Prada and her Lima New York Project, participatory performance art-ist Carrie Dashow, cultural organizer/icon Jason Andrew, sound and movement researchers William Bilwa Costa and Martin Lanz Landazari, Ashley Kelly-Tata of Enthuse Theater, Melanie Armer and Chance Mueleck of Nerve Tank, GoGoVertigoat’s Lindsey Drury, and interdisciplinary practitioners Sarah Maxfield, Angela Washko, Rebecca Patek, Nate Hill, Hyatt Michaels, Gelsey Bell, Dave Thrasher, and many others!